At Free Beauty Events we love trying out the latest mascara. 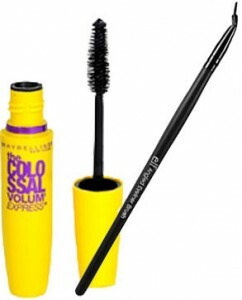 This time, we tried Maybelline’s Volum’ Express the Colossal Mascara. This promises to give 9x the volume instantly with one coat. We found one coat to be enough for day, and we were surprised to see that we got a more natural look. With a name like ‘Volum’ Express the Colossal’ you might expect a more false lash look, but this is not a high drama mascara. As promised it went on clump free (which can be an issue with volumizing mascara). In our opinion, this gives the same effect as their Great Lash Mascara. But we liked that the Volum’ Express is collagen enriched – excellent for your lashes. To see other mascaras we’ve reviewed click here. Tip: Mascara also works great as liquid eyeliner. Buy a slim eyeliner brush such as the e.l.f Studio Angled Eyeliner Brush and insert it in your mascara tube. It’s just $3.00 and you can use it to turn all of your mascaras into double-duty products!